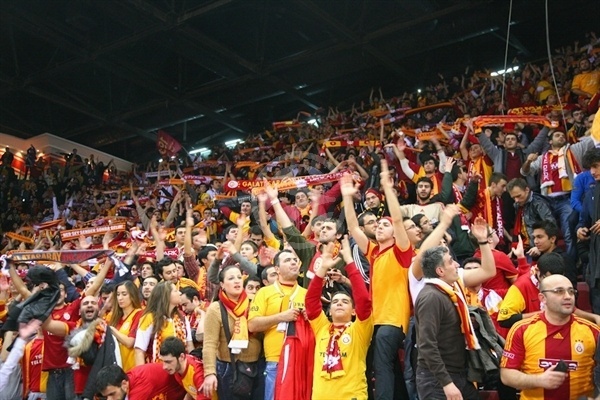 Galatasaray Medical Park sent a message that echoed all around the continent by downing previously undefeated CSKA Moscow 68-64 in Top 16 Group E in front of an unbelievable sellout crowd of 11,300 fans in Istanbul, Turkey on Thursday. Galatasaray improved to 2-2 and tied with Olympiacos BC Pireaus for second place in Group E. CSKA dropped to 3-1 and still leads Group E but saw its 13-0 Turkish Airlines Euroleague winning streak come to an end. Josh Shipp led the winners with 22 points. 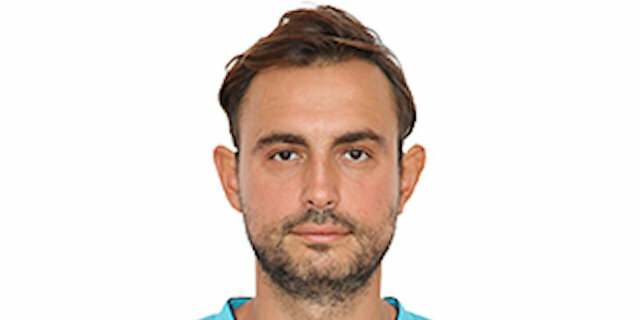 Luksa Andric added 16 for Galatasaray. Sasha Kaun and Alexey Shved led CSKA with 11 points apiece. Andrei Kirilenko added 10 for the guests, that used an 0-11 run in which Ramunas Siskauskas struck twice from downtown to get a 20-26 lead midway through the second quarter. CSKA boosted its margin to 35-45 right after the break but Andric and an unstoppable Shipp led a 16-5 run that put the hosts back ahead, 51-50. It all came back to the final minute, as Milos Teodosic brought CSKA within 66-63. Teodosic missed a couple of key free throws with 10 seconds to go and Shipp rounded his great individual performance with the game-clinching foul shots down the stretch. Andric got Galatasaray going with free throws, as the hosts tried to double-team Nenad Krstic from the very beginning. Teodosic struck from downtown but the guests were forced to use long possessions, as Galatasaray kept denying all passing lines. Meanwhile, a wild dunk by Andric restored a 4-3 Galatasaray lead. Jamon Lucas shined with an acrobatic basket but CSKA kept trying to feed Krstic in the low post. The guests tried to play more aggressive once Galatasaray got into the foul bonus. Andrey Vorontsevich finished a four-chance CSKA offense with a jump hook and matched Andric's power basket with a fast break layup to keep the guests within 8-7. Kirilenko split free throws but Shipp followed a jumper with a triple for a 13-8 Galatasaray edge. Sasha Kaun took over with a layup-plus-foul and even when Shipp scored again, free throws by Kirilenko kept CSKA within 15-13 after 10 minutes. 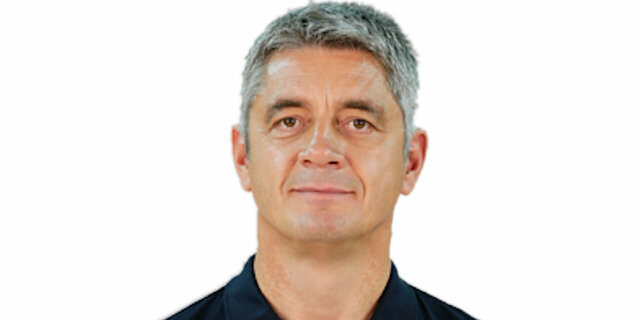 Kaun scored in the low post early in the second quarter but Shipp kept pacing Galatasaray with a put-back basket, as the hosts now tried a more experienced backcourt with Jaka Lakovic and Ender Arslan together on court. Lakovic nailed a three-pointer but Kaun dunked it to keep CSKA as close as 20-17. Siskauskas buried a triple and Kaun added a three-point play that put CSKA back ahead, 20-23. Siskauskas capped an 0-11 run with another bomb from downtown that forced Galatasaray to call timeout at 20-26. 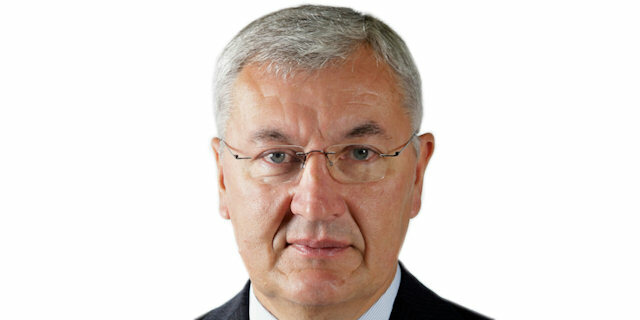 Lakovic stepped up with a backdoor layup that Shved bettered with a corner three-pointer. Andric set the crowd on fire with a huge dunk that Kirilenko quickly erased with a baseline jumper. Andric insisted with free throws and catch-and-shoot triple by Cehver Ozer brought Galatasaray within 29-31. Shved answered from downtown off a timeout but Lucas shined with a fallaway jumper. Free throws by Shved fixed the halftime score at 31-36. Andric scored off a wild spin move right after the break but Krstic erased that with free throws - his first points. Vorontsevich took over with a fast break dunk that gave CSKA a seven-point lead, 33-40. Andric kept trying to change things with a jump hook that Kirilenko improved with a bomb from downtown. Krstic soon added a jump hook in transition that boosted the guests' lead to double digits, 35-45. Shipp ignitd the hosts' comeback with free throws and a power basket in a 6-0 run that Andric capped with a fast break layup that made CSKA call timeout at 41-45. Krstic scored down low but Shipp stayed on fire with an acrobatic three-point play and a rainbow jumper that got Galatasaray even closer, 46-47. Shved shined with a triple but an off-balance jumper by Ozer and a three-pointer by Huseyin Koksal completed the hosts' comeback, 51-50. Jamont Gordon made 4-of-4 foul shots but Ozer matched those with a close basket and a jumper for a 55-54 Galatasaray edge after 30 minutes. Both teams went scoreless for almost 2 minutes until Kaun split free throws. Shipp stepped up with a tip-in for a 57-55 score. CSKA kept struggling to score and Arslan struck from downtown to make the guests call timeout, 60-55, with under 6 minutes to go. 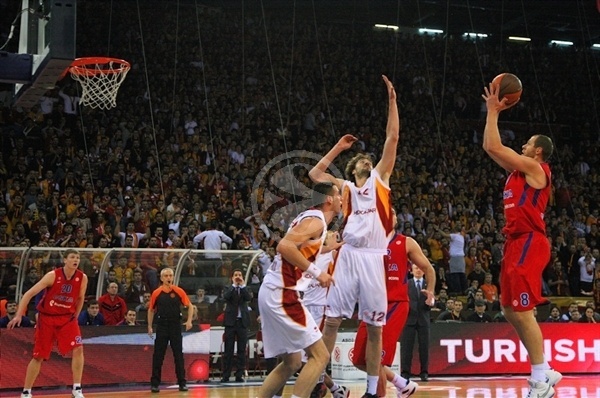 Kirilenko shined with an acrobatic basket but Lakovic split free throws for a 61-57 Galatasaray edge. CSKA kept missing open shots but defense kept the guests alive. A tip-in by Krstic made it a two-point game, 61-59, with 3 minutes left. Lucas took over with a turnaround jumper, as CSKA was unable to score right when it mattered. A five-meter jumper by Lucas seemed to seal the outcome but Teodosic buried a running triple for a 65-62 CSKA deficit. Arslan and Teodosic traded free throws and Galatasaray turnover gave CSKA the ball back, 66-63, with 10 seconds left. Teodosic was fouled while attempting a three-point shot but made 1-of-3 attempts. Shipp drew a foul and calmly made free throws to seal the outcome, allowing all Galatasaray fans to celebrate their team's biggest Euroleague win ever! "We tried to stop their fast breaks, and we succeeded. I thank my players for their hustle on the court, and I thank these incredible fans for their support." "I can't say we played bad, but the key point is Galatasaray wanted to win more than we did. And that brings the glory to them." "We showed one more time that with the crazy support of the best fans in Europe, there is no team that we cannot beat."